Here, i’ll explain why you need to drink enough and offer some tips to help you stay hydrated. As a basic guide, most people need about 1.5 to 2 litres of fluid a day, which is about eight to 10 glasses. You can get this from water and other drinks, such as milk and fruit juice. Water in food also counts – fruit and vegetables contain lots of water. Cucumber and lettuce have the highest water content of any food – a massive 96 per cent. Tomatoes are also packed with water – they’re about 95 per cent water. Just adding some salad to a sandwich can top your hydration levels up. Water is the best choice when it comes to meeting your body’s needs for fluids. It doesn’t have any calories and is free if you drink tap water. If you find plain water unappealing and want a tastier drink, then squash, milk, fruit juices or teas will also top up your fluid level. It’s a trade-off though, because these contain calories, usually from sugar, and they can damage your teeth. One way to make water more exciting is to add slices of lime, orange or lemon. Cucumber is also nice. It gives the water a fragrance and taste that makes it much more interesting. It’s healthy, hydrating and homemade. Coconut water is a popular drink these days and is another option for topping up your fluid levels. It contains the mineral potassium, as well as sodium and natural sugars. It’s sometimes used to replace lost fluids to treat dehydration. It’s also been reported to contain antioxidants. But remember those sugars, so don’t drink too much of it. Fruit juices and smoothies contain lots of vitamins. One glass (150ml) can make up one of your five portions of fruit and vegetables a day. But the downside is, they contain lots of sugar and can be acidic, both of which are bad for your teeth. Because of this, it’s best to limit how much fruit juice you drink and to have it with a meal. You can read more in our blogs: How to spot sugary foods and protect your teeth and Acid erosion and your teeth. One way to dilute all that sugar is to blend fruits with water or ice. Here are some top tips on how to make smoothies. Use crushed ice to thicken your smoothie rather than using yoghurt or milk. 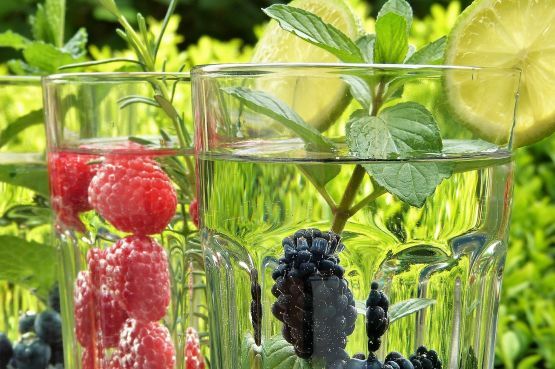 Water-rich fruits include grapes, watermelon, kiwi and oranges, so these are good to add to your mix. Water-rich vegetables for your green juices could include iceberg lettuce, cucumber and celery. You can also use herbal teas in your juices and smoothies – peppermint works well. Fizzy drinks and squashes can contain more calories and sugar than you would imagine. Some fizzy drinks contain a whopping nine teaspoons – 35g – of sugar. If you still decide to go for these, choose squashes with ‘no added sugar’ on the label or low-calorie versions of fizzy drinks. Milk is a good choice because it contains nutrients such as protein, B vitamins and calcium as well as being a source of water. Be careful how much you drink because it can also contain saturated fat. Choose semi-skimmed or skimmed options. If cow’s milk doesn’t agree with you, soya, rice and almond milk are alternative options. Some are fortified with calcium to ensure you don’t miss out on this vital nutrient. Tea, the nation’s favourite, and coffee also contribute to your fluid intake. Both contain caffeine, which is a mild diuretic so they can increase the amount of urine you produce. But if you drink caffeinated drinks in moderation, you shouldn’t need to drink extra fluid to compensate for this. Limit yourself to no more than 400mg of caffeine a day, which is about four to five cups of coffee or nine cups of tea a day. If you’re pregnant, have less (two cups of coffee or four cups of tea). As an alternative, you could try herbal teas or decaffeinated versions. It’s also important to remember that fizzy drinks and energy drinks can contain a lot of caffeine. Check the label and add these to your count so you don’t go over the recommended limit of caffeine. Although technically, alcoholic drinks contain water, they’re also diuretics and make you lose water from your body as urine. You can get dehydrated if you drink too much alcohol, so drink water or other soft drinks alongside alcohol. Remember to drink sensibly. Nutritionally, bottled water is barely different from tap water. Tap water is safe to drink in the UK. But if you’re abroad and unsure about the quality of the water or aren’t used to it, it’s usually best to stick to bottled water. Make sure the cap is sealed, and don’t add ice unless it’s made from bottled water. If you drink enough water, it will also help to keep your skin healthy. It’s important to keep your body’s water content topped up, otherwise you might develop dehydration, which is a lack of water in your body. This can happen when you lose more water than usual – for example, if you have a bout of vomiting or diarrhoea or don’t drink enough. Other ways you can get dehydrated include sweating a lot and drinking too much alcohol. Dehydration can be really serious, especially in babies, children and older people. If you have severe dehydration, your body stops getting rid of waste products and you may develop kidney failure. If you think you may be dehydrated, you need to rehydrate your body by drinking fluid. For mild dehydration, the best way to hydrate is by drinking water. That may be all you need. It’s better to drink little and often rather than trying to drink a lot all in one go because this may make you vomit. If you have more serious dehydration that’s caused by diarrhoea or vomiting, you’ll also be losing important salts and sugars from your body. A good way to replace these is with rehydration sachets, which you add to water. Some people choose sports drinks but these contain much more sugar than you need so it’s best to stick to rehydration sachets. If you have more severe dehydration, ask your pharmacist or GP for advice. You may need to go to hospital to be given fluids through a drip. A good way to gauge if you’re drinking too much is to check how often you’re going to the toilet. If you’re going lots and your urine looks really pale, you might be drinking more than you need. This entry was posted in Nutrition, recipe by makeyourmarkonlife. Bookmark the permalink.